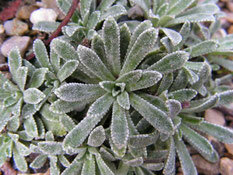 SILVER SAXIFRAGES - SECTION LIGULATAE INTRO PAGE - De website van alpigena! Sorry to say but mature Silver Saxifra's are sold out for spring. 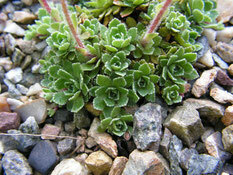 Enough young Silvers Saxifraga's available but just potted up. 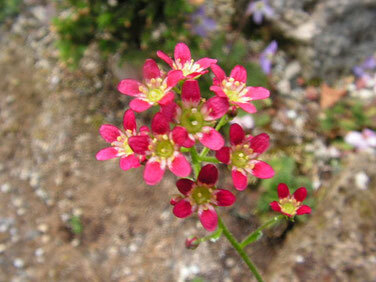 Please scroll slowly down and read before entering the Silver Saxifrages Catalogue. On this page we give you a short explanation about the importance of the Silvers. the Silvers we list in our catalogue. photo's of the Silvers in flower. So we have to make new photo's the coming Silver season. 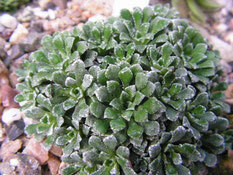 Saxifrages from the Ligulatea section are often named as 'Silvers' This comes from the Silvery-grey leaves especially when grown in poor gravelly soil which they prefer. They are rather easy to grow! An other important feature is the encrustment on the leave edges, which is infact lime-sweating. 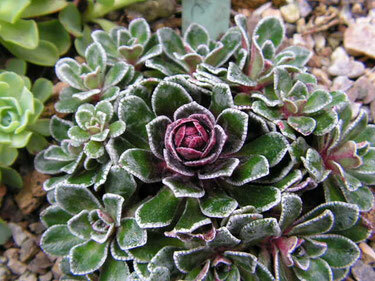 Silvers are very important for us Alpinegardeners for they flower after most Porophyllum Saxifrages and General Alpines are out of flower. 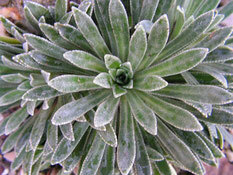 They start to flower in May and June and can flower rather long when weather is not to warm. They can deal with a fair amount of sun and wil do best in a rather poor and gravelly soil mixture. They all flower with a spike with many,many litlle flowers which gives a great display in our rockgarden. 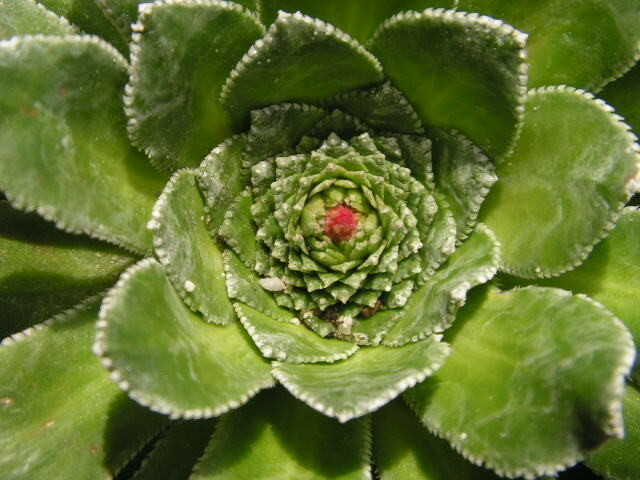 The flower color is mostly white or white with small red dots. A few Silvers are creamy, rose or red. Flower stems can be very long up to 50-60 cm! Or small up to 5-10 cm with the more dwarfish silvers. But the most important feature of the Silvers are ofcourse the rosettes! 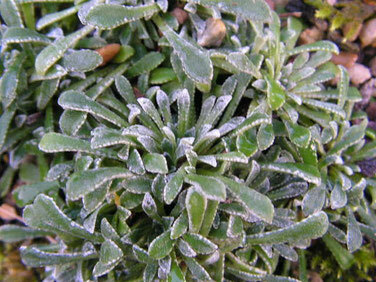 Like the Porophyllum Saxifrages...the Silvers are whole year long....GREEN!. 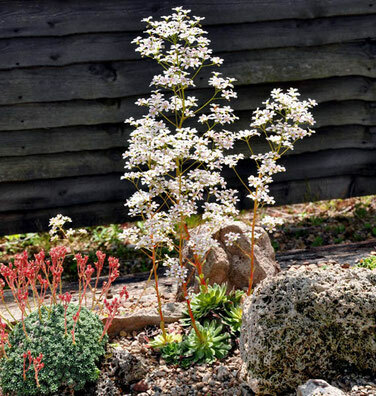 So when all the other Alpines are out of flower or gone during autumn and winter ......the Saxifrages give your garden the 'body' it needs! One can find all kind of different rosettes....Big...Small....Grey...Green....Silvery.....round....spiky......sharp. 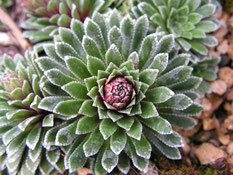 That's why more and more alpine lovers collect these important plants! 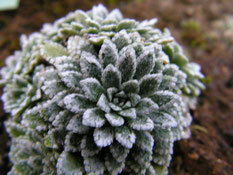 We always try to increase our collection so we can offer you a excellent stock of Silver Saxifrages!